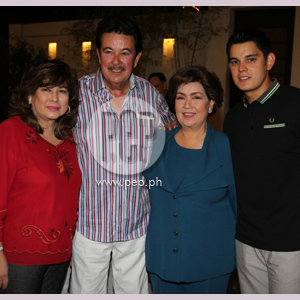 Instead of going all out with a lavish party, Annabelle Rama opted to throw an intimate gathering of close friends to celebrate her husband Eddie Gutierrez's 70th birthday. On February 11, she invited a few friends from in and out of showbiz to their newly renovated home in White Plains, Quezon City for a sumptuous dinner served by Le Souffle's Chef Jessie Sinsioco. Four tables were set on the garage for Eddie's and Annabelle's friends. Joining the couple were Senator Tito Sotto and wife Helen Gamboa, Ilocos Sur Governor Chavit Singson, Susan Roces, Pilita Corrales and husband Carlos Lopez, Ricky Davao and TAPE Inc.'s Malou Choa-Fagar. The Gutierrez children—Ramon Christopher, Ruffa, Richard, Elvis, Rocky, and Richie Paul occupied another long table on the veranda together with peers Bubbles Paraiso, Assunta de Rossi, TJ Trinidad, and Neil Arce among others. Richard was with rumored new girlfriend, Spanish-Filipina model and jewelry designer Girlie Benitez. AN EVENING OF SONGS. Also celebrating with grandpa Eddie were Ruffa's daughters Lorin and Venice Bektas who performed a song and dance number to the tune of Adele's "Rolling In The Deep." Teary-eyed, he said in a short speech afterwards, "Now I know why when I entered the music room earlier, you suddenly stopped what you were doing. Thank you, my beautiful apos." Accompanied by a four-piece band, Eddie rendered Elvis Presley's "Blue Suede Shoes," and "Amor, Amor, Amor" with Asia's queen of songs, Pilita Corrales. HOMECOMING. The celebration also coincided with the homecoming of the Gutierrez's to their old house after living in a Makati village in the past few years. Some renovations were done in the house, including adjustment of the ceiling height to make room for more private spaces for the other family members. The old pond, which sits under the staircase leading to the second floor, as also enlarged to accommodate Richard's collection of koi and hammerhead fishes and Eddie's almost three-feet long arowana. The couple and their kids Elvis, Rocky, and Richie Paul all stay in this Quezon City property, while Richard lives alone in his condominium in Taguig. Raymond and Ruffa with her two daughters remain in the family's Makati mansion.